Choosing the right marking and coding system for your application is vital to your bottom line. 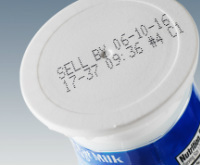 SSI Packaging Group has the most reliable marking and coding solutions on the market. We are committed to helping you find the marking and coding solution that provides the absolutely best product identification you demand and the maximum value you deserve. SSI Packaging Group stands behind every printing and labeling solution we provide with our superior 24/7 technical support and service. That's why we say, "we help you pack and track your image."